Cat Tree House In the wild, most animals have their special hide-aways; a place where they can hide from predators and feel relatively safe to catch a few winks. 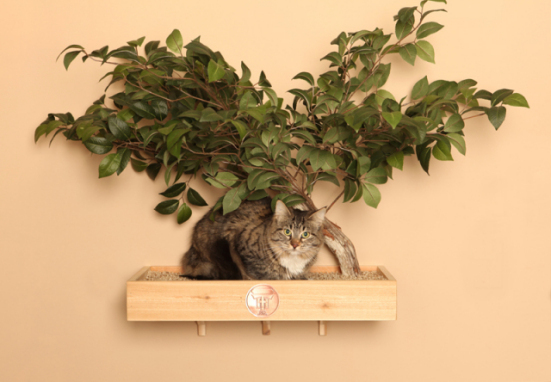 Indoors, our pets need special places too, havens away from humans, to rest, play, talk to themselves, or just hang.... Pet Tree Houses, LLC makes those havens with 'special' in all caps... for your dog, cat, bird, or snake. Each Pet Tree House is made from real trees, though the leaves are artificial (silk), because real ones could be harmful to your pet. Every cozy house, nest, shelf or toy is made by hand and each is unique. I think you will agree, these examples are extraordinary. 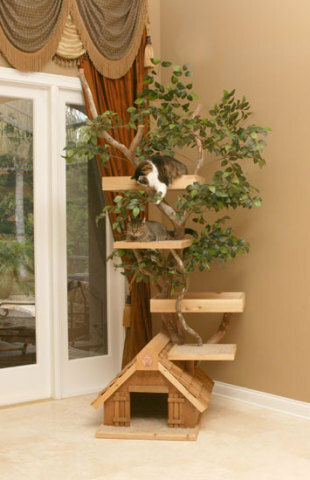 The Large Cat Tree House is 7-feet tall and perfect for multiple cats, who can finally sharpen their claws on a real tree! 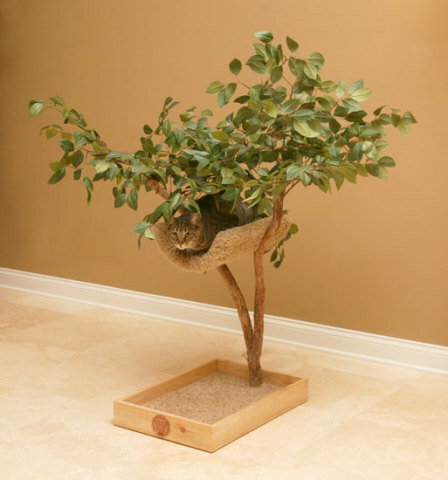 Five levels of plushly carpeted wood give your cats plenty of comfort wherever they land. Carpets and toys (2) are removable. 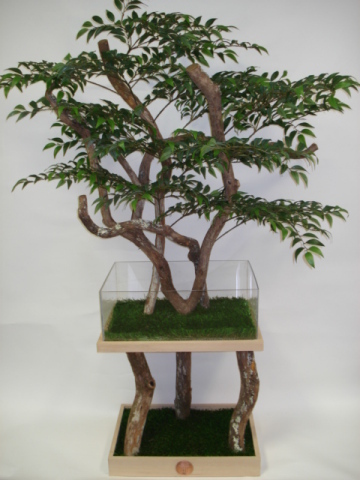 This tree can be custom made in any size. 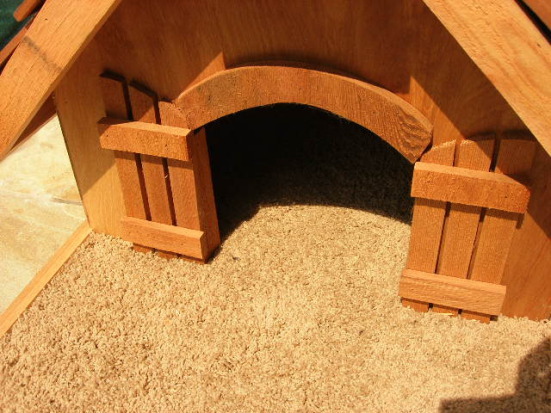 The cat and dog houses can be customized with an arched cut entry with doors if you like! Sure enough, it's every pet reptile's dream! Isn't it splendid? The tree is made of oak and dragonwood and it allows for snake flexing (ooooh) and climbing. Wall is acrylic and synthetic grass is optional. 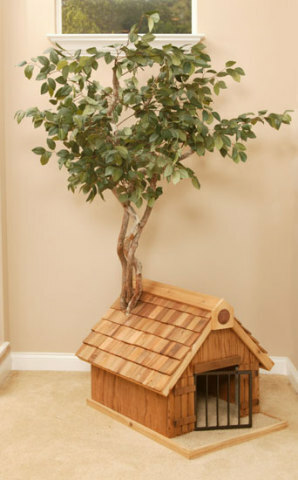 For small to medium dogs the dog Pet Tree House has these dimensions: 32" deep x 26" wide x 27" high. Woods used are cedar, oak, and dragonwood. The tree is 70 inches high and notice that it's raised (so your pup won't think it's there to pee on). Isnt' this precious? And that's a carpet on the floor of the Tree House, not litter! 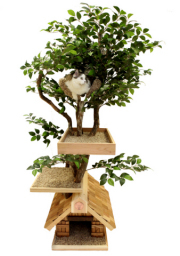 This model is the Deluxe Bird Tree House and I can certainly see why it's called that. What more could a bird want, except to bring his Tree House with him as he follows you from room to room. That can be done; the stand is equipped with caster wheels. Cats climbing the walls? Give them a great place to perch and look down on you. The Cat Flats even come right-sided and left-sided, depending upon where your cat will be jumping from. 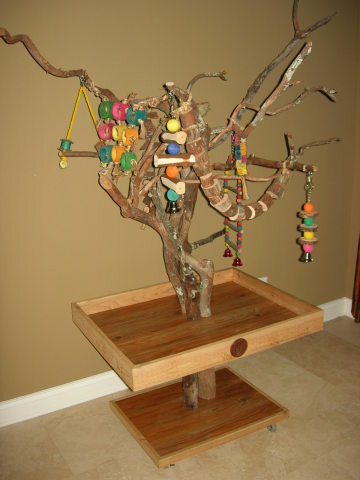 Pet Tree Houses has a wide variety of perfect "outdoor" havens for indoor pets, and if you don't see what you like, you can design your own, since the company does custom work. All Pet Tree Houses are shipped assembled, in case you're wondering about trying to put the Tree Houses together.